When I think about summer, I think about the beach, the long days spent at the beach with my parents and siblings and the painful sunburn on my shoulders and back. When I think about summer, I think about the naps we would take my mother and I in the living room because it was the coolest room in the house. We would sleep on a thin mattress right on the floor and wake up sore all over and completely disoriented. We would swear to never take a nap on hot days again but would do it again the next day. When I think about summer I think about my father bringing home every afternoon two watermelons, a melon and three pounds of prickly pears that he had bought from roadside stands. I see my father sitting on his favorite small bench in the kitchen deck, holding the prickly pear with newspaper paper in one hand, the knife in the other hand to open the fruit and asking my mother to remove the fruit from its prickly skin. When I think about summer, I think about children in my neighborhood cooling off as much as they can by swimming in the fountain square. When I think about summer, I think about open-air markets, fishermen yelling: “Sardines! Sardines! La belle sardine!” fruits and vegetables trying to steal the highlight from one another, people laughing, speaking out loud and bumping into one another. When I think about summer, I think about my mother’s frenzy for red peppers. Every time we would go to the market, she would go straight to the red peppers stand, claiming that there is not much left at home. Although I know and she knows and our fridge knows that it’s already full of red peppers. Raw, grilled, stuffed, roasted, she is always looking for new ways to cook it, but the most recurrent and craved red pepper dish at home is simply roasted and marinated in olive oil, salt and garlic. 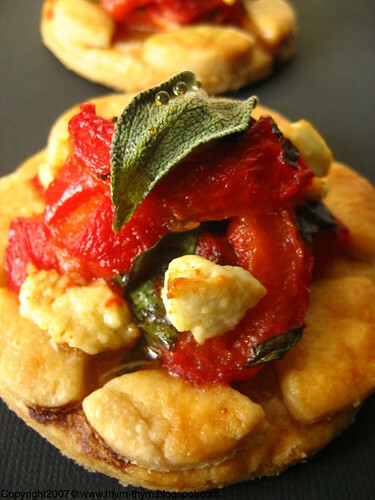 In this personalized recipe I took my mother’s recipe, added some crumbled goat cheese, sage, laid it on a flaky crust and drizzled some honey on top of each tartlets. 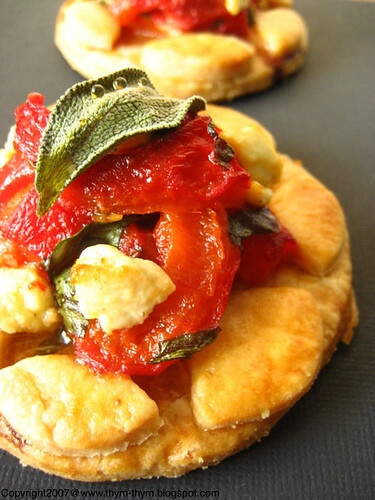 The spiciness of the sage and goat cheese is balanced by the sweetness of the honey and the red peppers, and the crust is so flaky that you wouldn’t need to use a knife or even a fork. These kinds of tartlets are perfect as a light summer lunch, along with, if I may suggest, a bowl of mixed green. A bite of them and you will find yourself sitting next to the peppers stand of our market. Just don’t serve my mother some of your red peppers if you see her coming your way. Couper les poivrons en lamelles et les melanger a l’ail, feuilles de sauge, sel, poivre et huile d’olive. Laisser mariner ½ heures ou plus si vous avex le temps. Plus vous le laisser mieux le resultat sera. Faire votre pate selon la recette. A l’aide d’un emporte piece, couper des discs de la pate, decorer avec des feuilles ou autres selon votre desir. Faites cuires vos discs de pate dans un four prechauffe a 200C pendant 10m min, puis reduire le four a 160C et laisser cuire jusqu’a ce la pate brunisse legerement (voir photo). Mettre un peu du mélange de poivron rouge sur vos discs de pate, en faisant en sorte de pas mettre trop d’huile d’olive sur les discs de tartelettes et en evitant de trop remplir ces dernieres. Decorer chaque tartelette de fromage de chevre emiette, d’une feuille de sauge et de quelques gouttes de miel. Retourner les tartelettes au four pendant 5 –7 min juste afin que le fromage fonde un peu et se colore legerement. Laisser refroidir sur une grille a patisserie puis servir tiede accompagnees d’une simple salade verte. What wonderful thoughts. I join you in many of these and find that summer really is the best time of the year. 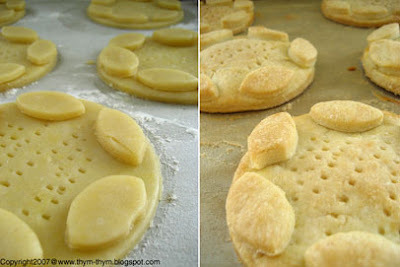 These cute little tartelettes look truly amazing! Ah l'été... Les souvenirs d'enfance, les meilleurs. Not only do these look and sound fantastic, but I love the story behind them! Rose, I always love reading your posts, I can even picture the situations, so many wonderful details! These tartlets look delicious, and they're beautiful! c'est absolument irrésistible, de la description de ce que t'évoque l'été à cette sublime recette! I can't help admiring your cute tartlets. Incredible! When I think of summer I remember that it's winter here and I am longing for some warmth! Lovely, memory-filled post. GORGOEUS recipe and photograph. Lovely memories, lovely post, incredibly lovely photograph! Incredible summer memories! Most lovely. . .I never know where you'll take me but I always seem to love it when I get there. The tartletts are so much warm summer. And I'm thinking I should always keep a jar of roasted red (maybe orange and yellow too) in my fridge . . . what a plan . . . they are so good. Here I go again looking at these beautiful pictures when I am starving. Not a good idea. Fantastic flavour combination. I have tons of sage in my garden but often forget to use it. You are making me long for summer! We've had no warm weather at all the last couple of months. :( This won't stop me from making these gorgeous wee tarts though! Désolée de n'avoir pas assez de temps pour répondre à ton gentil email . Mais dès que je peux , je le fais . Oh Rose, I can't wait to try this tart with the beautiful red peppers that I can buy here in Nice! Thank you.